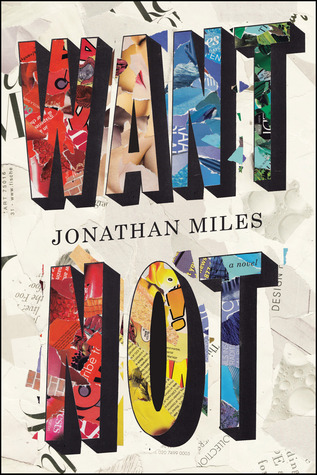 In his new novel, Want Not, author Jonathan Miles explores the concept of wanting in contemporary American society. The story moves between the disparate lives of three groups: Elwin Cross, an overweight linguist professor whose wife has recently left him for a chef; Talmadge and Micah, a young freegan couple squatting in a tenement in Manhattan; and Sue, a 9/11 widow, her daughter Alexis and David, her debt collection businessman/new husband. Each has wants, from Elwin’s desire to get his old life, his old self back to Dave, who’s built his fortune on collecting the debts of the many who wanted too much, but also wants it all and wants it now. It is only as events unfold in their lives that they see where their desires have left them. Whether it is deliberate on Miles’ part or not, the old saying “Waste not, want not” will come to mind as the novel progresses. The freegans are an obvious example with their dumpster diving, off-the-grid lifestyle, which they embrace with religious fervor. Even the television seemed to affirm this uncertainty as she went scrolling through the channels, yearning for anything that might speak to her, distract her, entertain her, fulfill her for even half an hour, from channel 100 through channel 1195…How obscene and astonishing it was, she thought, that amidst all this digital plenty, there could still be nothing. There are moments in Want Not that are almost too real- gross frat-boy antics and the bloody drama of childbirth to name two. The urge to stop reading may occur (because, really, how much do we need to know about other people?) but in capturing the profound and the profane the adept Miles creates a novel that touches with its basic yearning for more with less. Read on, this want you should heed. I actually liked the scene where Elwin deals with the deer. I had no idea how it was done before. And the child birth scene made me uncomfortable because it felt so real. I agree, Tanya! My father was a hunter so it brought back memories- also made Elwin endearing, in a funky way. The child birth scene made me very tense- and I’ve never given birth! Miles’ prose was raw and real. I’m always so in love with your reviews. I’m glad you ended up finishing it and weren’t too put off by some of the ickiness, it’s one that I find myself thinking about more and more even though I’m now pretty far after reading it.